Galletta's Greenhouse Karting Club, located in Oswego, NY, is a go-kart racing club that specializes on racing as professionally as we can for as economically as possible. 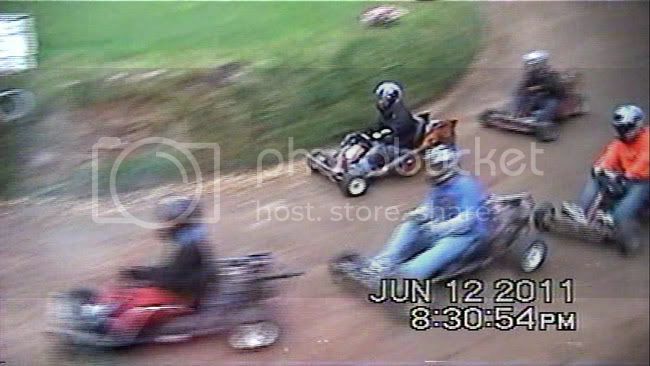 In the early 1990s, we developed a style of kart racing that is different, but no less competitive than any national karting organization. Our biggest difference is affordability. 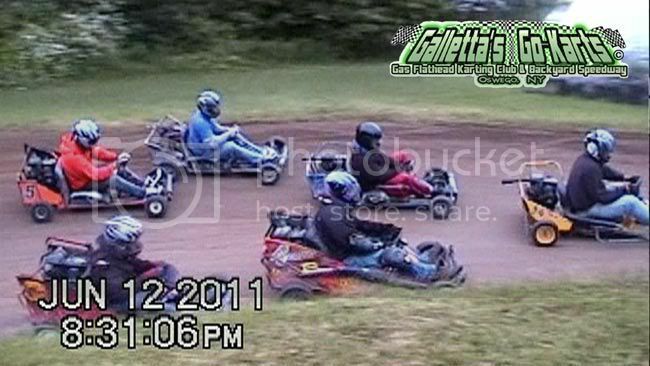 Our club is free to join and race in, and the only thing anybody pays for is gas and parts. 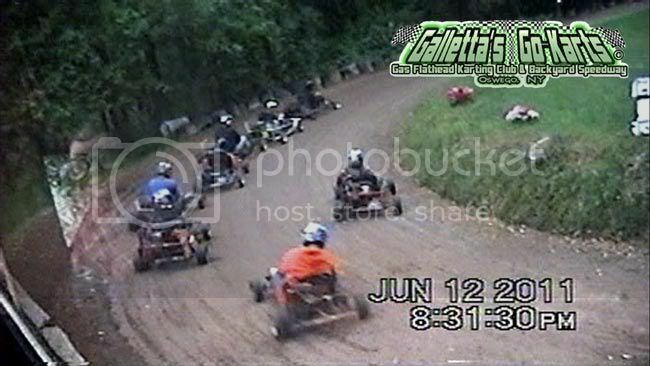 We are the largest and longest-running dirt karting class in the local area, as we were founded in the early 1990s and our average feature is 45-Laps usually consisting of 10-15 karts, with a 200-Lap "Klassic" Championship at Summer's end deciding an Annual Points Champion. 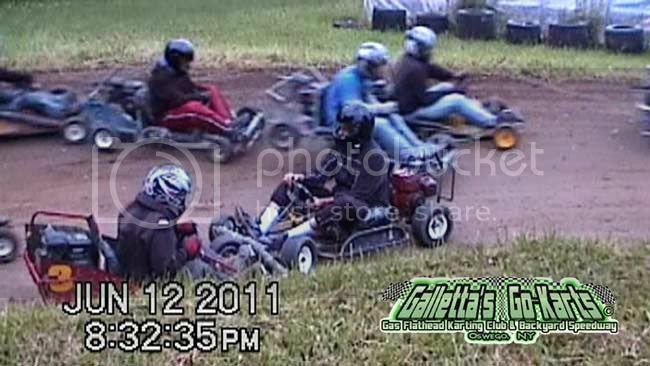 We race homemade 1-Wheel-Drive racing karts that can race on professional karting tracks and backyard speedways alike. We have karts rebuilt from used racing chassis, used yard karts and some built from scratch. We have ONE class to ensure a true overall track champion, and not have several smaller classes of divisional champions with no clear winner. We race used 5hp Briggs Flathead motors fueled by pump gas, sped-up by hand-shaved heads and select racing cams, and regulated by stock Fun Power-type carburetors instead of expensive pre-fabricated 2-WD chassis powered by high-priced methanol-fueled motors. On our own backyard oval speedway, we turn clockwise with our top speeds approximately 45-50MPH. Although we all run in the same division, in addition to a minimum weight requirement, we have something unique to our inclusive class -- a weight-to-power-allowance scale to allow heavier drivers more horsepower via stronger racing cams and more powerful gear ratios, a system proven to be successful as we have the tightest competition and most varied winner's circle locally over the last few years. This way our one class is bigger than the higher-priced karting classes, because heavier and lighter drivers can race equally and having the same chance of winning as the next guy. Racing experience, starting position, and a little bit of luck usually decides the outcome, and money and kart price play no role. To ensure this, we have an expert motor builder -- club co-founder Matt Stevens - who oversees that all of the motors are legal, equalized, and competitive, and does so for no cost - just to have people to race with! Join us and find out what many people, including semi-pro drivers from local racetracks say - we have the most fun and spend the least money of likely any competitive motorsport class in the world! The club races every Sunday afternoon all summer starting on the first Sunday in June annually in back of Galletta's Greenhouse and running every wekend until the weather stops us in the Fall. We race qualifiers and a 45-Lap feature most weeks, but change up to occasional Twin-30s or the occasional 55-Lapper. All races count for points and are tallied at the end of each season to determine the track champion. The season concludes with the 200-Lap Galletta's Karting Klassic in late-September or early-October. Our club is free to watch and free to join, and runs 100% off donations of the racers. 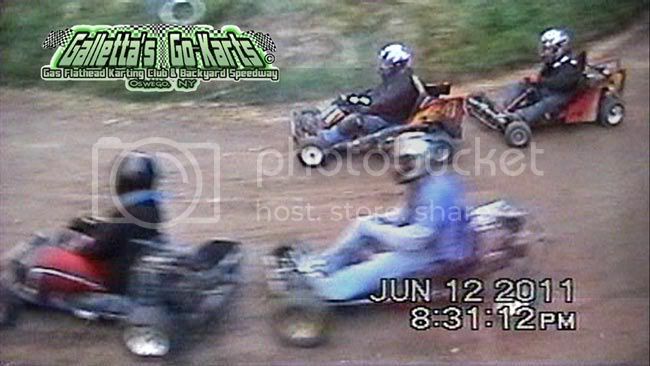 You can race a Galletta's Team Kart for a nominal gas & parts donation, or race your own. We will help you either way, whether it be using a Galletta-kart or building one for yourself. We're not in this to make money and we're not in it to further a career in racing. We are in this to have fun racing with friends and family and be mini-superstars on our lil' website for as little money as humanly possible. And can your $1,000-$7,000 methanol racing kart go over 20 miles reaching speeds between 30-50MPH per lap in one race on one tank of pump gas? No? Well, we can. Join us! Enjoy the site! JUNE 12TH, 2011: Twin 30s were in store for week two of the Galletta's Greenhouse Karting Club Season. We like them because we handicap the first race via points/wins and invert the finish for the 2nd, always leading up to some excitement. We also like them early in the season to establish more winners and points scored for the season standings. 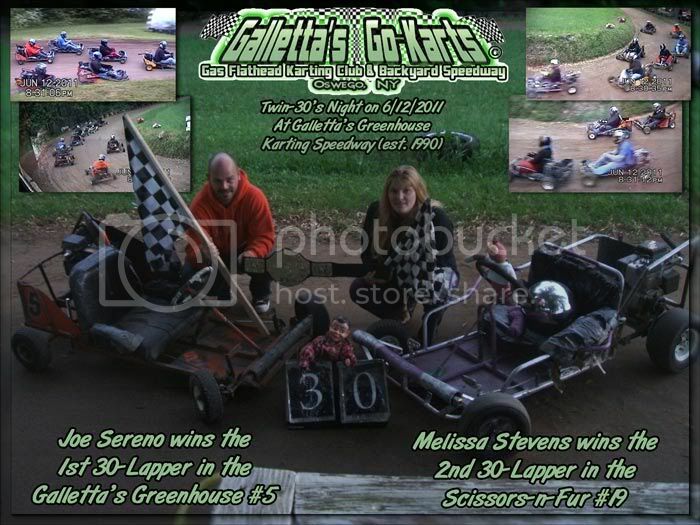 Rookie Joe Sereno won his first feature in his 2nd race he's ever entered in the Galletta's Greenhouse #5 kart, while Melissa Stevens took her Scissors-n-Fur #19 back into victory lane in the second 30-lapper. Both features were close and action-packed! Details, pictures, points, and YouTube video below! Above is this race's menu. 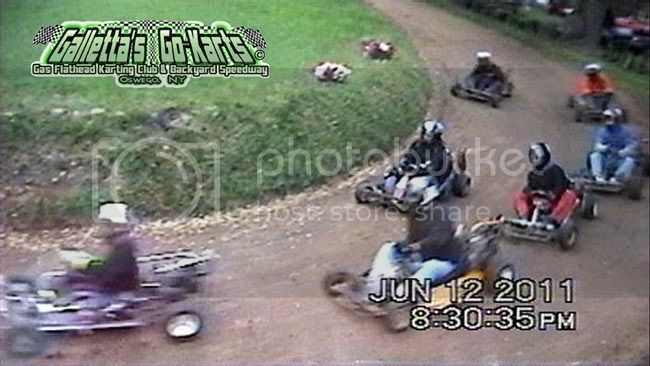 For a DVD copy of this race, please email or call Chris Stevens and ask for Galletta's Karting Club 2011 Volume #2. Each disc is chock full of between 1 to 3 hours of racing, often from multiple angles and are only $5 each (discounts available for multiple copies). We accept PayPal or cash, and can either ship or arrange for pickup. The 2nd feature was started with an inverted finish from the 1st. AJ Nason retired his Nason Motorsports #35 due to a sputtering motor (likely carb or 2-hung-low header), and hopped into the Galletta's Greenhouse #1 for the 2nd feature. The Galletta's #1 led the vast majority of the 2010 Klassic 200-Lapper with Kyle Reuter behind the wheel. Nason led 26-laps until he was pressured by Matt Stevens, and spun out directly into him. As you can see the Galletta's #7 driven by Justin Galletta also hopped a tire, bending a sprocket, which netted Justin a DNF. For the Galletta's Karting Club's World Championship of 1WD Gas Flatheads held on Galletta's Greenhouse Backyard Karting Speedway. After 1 race on 6/5/2011. Our complete All-Time Points Standings from 2000-2010 are found on this webpage. Rookie Joe Sereno leapfrogs into the lead after his impressive feature win in seasoned veteran fashion! Matt Stevens has been passing the most drivers (what else is new? ), but has also wrecked a lot more than usual as well. Oddly enough, in an unusual twist, 1st and 2nd place in the points may have been involved in the most cautions so far this year and still maintain a lead! On a side-note, three drivers - a vet and two rookies - were scheduled to make it and had rides waiting for them had a change of plans at the last moment, keeping our kart count down more than it usually is (but still more than most local karting divisions). And the batch of 7-10 rookies that were so pumped and gung-ho about racing here after our season finale 200-Lapper (and drove in two non-point rookie exhibition races) have not yet shown up on race day, despite the fact that they bought not one, not two, not three... but four Galletta-type 1-WD hybrid racing karts in the offseason! I sense Gary Miller Sr. is up to his ol' two-face, lyin' backstabbin' mealy-mouthed gossip -mongering (as usual) and turned total strangers against us. Thanks, Gary! You backstabbing son of a b****!